There are important questions that strike at the heart of what the Lynx will look like going forward and whether they can remain legitimate contenders. The dominant storyline at the end of this Lynx season — and rightfully so — has centered around the retirement of all-time great Lindsay Whalen. She’s been in many ways the heart and soul of four WNBA championship teams, and her retirement — announced last week and then hastened by a first-round playoff exit Tuesday against Los Angeles — is significant on multiple levels. Not only does it leave the Lynx without one of their cornerstone players for really the first time since this dynasty started in 2011, it also invites even more questions about the future. Will Rebekkah Brunson follow Whalen into retirement? How much longer will 34-year-old Seimone Augustus play, and at what level? Those are important questions that strike at the heart of what the Lynx will look like going forward and whether they can remain legitimate contenders. But for as much as the age of the Lynx and the inevitable questions of when time would catch up with them have dominated the discourse, perhaps the more pressing and potentially troubling question is this: What was wrong with Maya Moore this season? For whatever reason, Moore never really found a groove this season — a rut punctuated by a subpar performance in Tuesday’s 75-68 loss. She finished 6 for 15 from the field and missed all her field goal attempts in the fourth quarter while also missing two crucial free throws that might have changed the outcome. The Lynx were outscored by 10 points when she was on the court. With a standout performance from Moore, the Lynx might still be playing. It was a microcosm of the season, which saw Moore shoot 42.3 percent from the field and 83 percent from the free throw line (both three points below her career average) and slip to 2.6 assists per game (tied for lowest in her career with her rookie year). Moore’s advanced numbers were even more damning: Her net rating — the difference between the points scored and points allowed per 100 possessions while she was on the court — was just 3.1. Each of the last two seasons, she was above 17. Her true shooting percentage, which factors in free throws and three-pointers, was a career-low 50.8. She was at 56.1 last season and has been as high as 62.4 percent in her career. Moore was still good and arguably the best player on the Lynx. 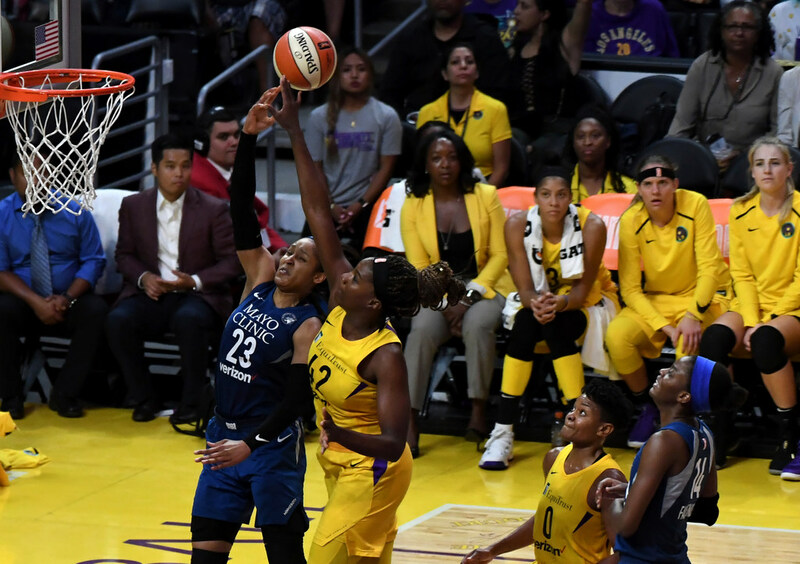 Along with teammate Sylvia Fowles she was named to the all-WNBA second team — meaning she was still one of the 10 best players in the league. But that was after five consecutive years on the first team and a league MVP award in 2014. Moore played in every game — she’s only missed one in eight seasons — but perhaps the WNBA’s condensed schedule this season wore her down? Maybe she was fighting a behind-the-scenes injury? Perhaps defenses were able to key on her more with older teammates contributing less? Those are all valid potential explanations for why a 29-year-old who should be at the peak of her otherworldly abilities had what was, for her, a down year. Everything about Moore’s makeup and work ethic suggests that whatever happened this year will be erased — and then some — in 2019. If Moore comes back better than ever, she and Fowles can still carry a rebuilt Lynx squad to new heights. But we saw what happened this year when Moore was merely good and the supporting cast wasn’t as consistent. The Lynx were still good enough to be a playoff team, but flawed enough to make an early exit. Going forward, the Lynx will need Moore more than ever.